This is a project I’ve been thinking about for a long time. It’s Forsythia a pattern by Symeon North (aka Pippi Kneesocks) in the book Spin to Knit. The pattern is VERY simple. It’s a top down sweater. You cast on the stitches for the neck, knit ribbing for an inch, and then add in your handspun yarn and start increasing until it fits over your shoulders. What could be easier? The blue yoke was knit with my own hand-spun yarn. I’ve had this in my stash for a couple of years now and have been dying to make something with it. It was the absolute perfect amount for the yoke. 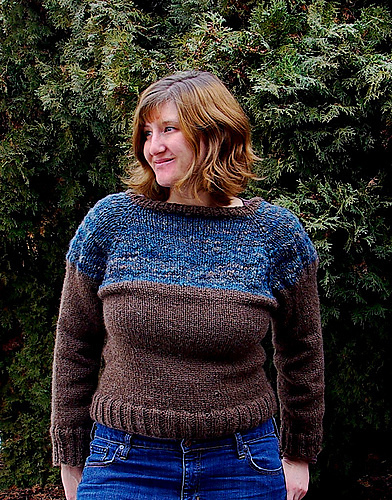 The rest of the sweater was knit with Cascade Ecological Wool. I used about 1 and 1/4 hanks. These are some humongous hanks of yarn. And it’s heavy worsted so you get to use larger needles. So, yeah. Fast knit. Which I like. I’m very happy with it! It’s a very comfortable, snugly sweater and one that I will wear on cold weekends. If you want more details you can visit my Ravelry project page.